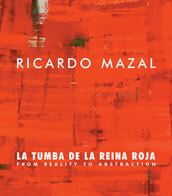 In his stunning series, La Tumba de la Reina Roja: From Reality to Abstraction, Mexican painter Ricardo Mazal expresses the profound sensations he experienced while visiting the Tomb of the Red Queen, a recently discovered burial site dating to about 600 AD at Palenque, the ancient Maya ceremonial city. Mazal began this body of work by extensively photographing the site's temples, stones, and surrounding landscape. These images became the basis for abstract works that reflect a creative dialogue between digital technology and traditional painting modes. In color photographs, monotypes, and monumentally scaled paintings, Mazal eloquently interprets the myriad themes evoked by this Maya noblewoman and her tomb - history and time's passage, spirituality, nature and culture, and human mortality. Ricardo Mazal was born in 1950 in Mexico and resides in Santa Fe and New York. The exhibition and publication of La Tumba de la Reina Roja: From Reality to Abstraction is a collaborative effort between Mazal and Chiaroscuro Gallery, Santa Fe and Scottsdale. He has exhibited his work extensively in the United States, Latin America, and Europe, including at such institutions as the Museo de Arte Contemporáneo de Monterrey, Mexico (MARCO); the Museo de Arte Carrillo Gil, Mexico City, Museo de Antropologia, Mexico City; the Americas Society, New York; and the Center for Contemporary Arts, Santa Fe. Mazal has received the prestigious Creador Artístico award from the Sistema Nacional de Creadores de Arte (FONCA), Mexico, and a Pollock-Krasner Foundation grant. Elizabeth Ferrer is a New York-based independent curator and writer who specializes in modern and contemporary Mexican art and photography. Exhibitions she has curated have traveled widely to museums throughout the United States, and her essays have appeared in exhibition catalogues, books, and art journals published in the United States, Latin America, Spain, and Great Britain. Ms. Ferrer is former director of the Austin Museum of Art in Austin, Texas, and gallery director and curator at the Americas Society in New York.